On 29 October 1795, George III was on his way to open Parliament, when his carriage was surrounded by a crowd calling for ‘peace’, ‘bread’, ‘no war’ and ‘no King’. The elaborate carriage (it had been in the family for some time) was badly mauled and, when one of the windows was broken, the startled King was heard to proclaim: ‘My lord, I, I have been shot at!’ A piece of glass that allegedly formed part of the carriage window is preserved in the Museum of London. Inflated by a sycophantic media and a reactionary Tory government into a conspiracy to rival the ‘Pop Gun Plot’ of the previous year, this direct interaction between a head of state and his angry subjects became the pretext for sweeping infringements of civil liberties in the form of the ‘Two Acts’. The following day, when the King insisted on attending the theatre, the streets had to be cleared and he was accompanied by 100 foot, 200 horse and 500 constables. On 28 January 1817, the even more unpopular heir to the throne, who had governed as Prince Regent since his father’s incapacity, had his carriage mobbed on the way to Parliament. The contempt of his subjects had many sources: the Regent rioted in luxury while his subjects starved; his expenditure on vast architectural follies and personal pleasures stood in stark contrast to the abject austerity endured by a people being forced to pay for a national debt they had had no part in contracting; and throughout his life the Regent had treated his legal wife, Caroline of Brunswick, abominably because of a string of mistresses and his real marriage to the Roman Catholic Maria Fitzherbert. Once again, either a stone, a potato, or, as an alarmist media preferred, a bullet, shot through the window of his carriage. Once again, a Tory government took the opportunity to suspend civil liberties. Once again they were aided by a supine media, but this time the cry of ‘foul’ from the growing radical press was louder. Satire was levelled at this government-engineered over-reaction. There were calls for the treasonable stones or potatoes to face trial, while William Hone’s Canticle of the Stone lampooned government alarmism: ‘O all ye workers of Corruption, bless ye the Stone: praise it and magnify is as a bullet for ever’. Marx famously repeated Hegel’s claim that all important facts and people in world history occur twice, but chided him for omitting to add that the first time they occurred as tragedy, the second as farce. Marx himself omitted to add that the third repetition was as panto. In December 2010 the hugely unpopular heir to the throne and his consort – ‘the dregs of their dull race, who flow through public scorn’ – were on their way to glad-hand Kylie Minogue and Gary Barlow when they were surrounded by an angry crowd. 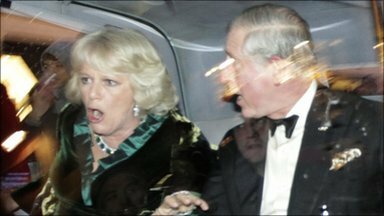 This time we have been left an iconic image of a horrified, dinner-jacketed and ruddy-faced Prince and an erstwhile mistress looking every bit the startled transvestite. Pure panto: ‘They’re behind you’. The shattered window of the Limousine must soon make its way to the Museum of London. Surely the only possible next step for David ‘buttery’ Cameron and Teresa ‘Wicked Witch of the West’ May is the further suspension of civil liberties. They have already begun to revive the language of the eighteenth century and started talking of angry citizens as ‘mobs’. Patrician instincts are very hard to suppress. The ‘Paint-Filled-Bauble Plot’ has begun its career. Sorry, I cannot agree with you. A group of rent-a-mob infiltrated a legitimate student protest and attacked my future king and queen. This was not the work of an enraged citizenry but rather that of would-be terrorists. LOL – fantastic Hugo – keep up the good work! Priceless and unimprovable. Thank you. Just when you thought youth had become acquiescent, they go and totally redeem themselves. p.s. Who is this tiny minority they keep going on about? They turn up at football matches too. I was standing on the edge of the kettle in Whitehall at about 6 p.m. You could sense it was all kicking off in the distance, inside Parliament Square, but it all seemed quiet and amiable where I was.